In association with PerkinElmer, we proudly release the Alpha SureFire® Ultra™ Multiplex assay portfolio, the only phosphoprotein multiplexing detection platform available that is truly homogeneous and high throughput. 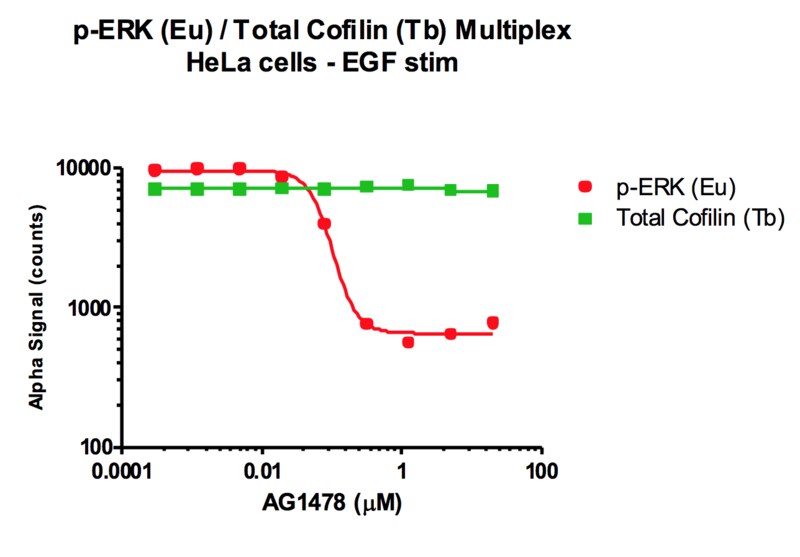 While the initial multiplex assay introduction (MPSU kits) included just a few kits for measuring phospho- and total ERK or AKT proteins, the newest additions to the group of multiplexing reagents allow for individual phospho-targets to be selected from a panel of Europium and Terbium-based individual reagents and combined as needed. This pick-and-pack capability allows scientists to choose dual targets of interest for easy implementation in the lab. Alpha SureFire Ultra Multiplex assays are divided into two categories (1) Multiplex SureFire Ultra (MPSU) kits and (2) Terbium SureFire Ultra (TBSU) kits. 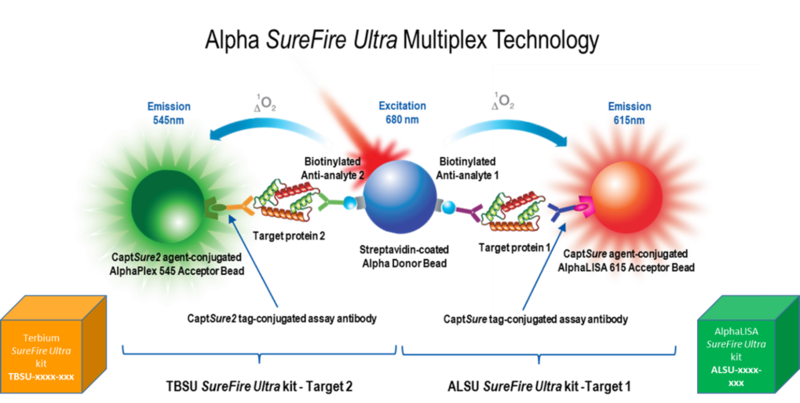 The MPSU kits are complete kits for phospho and total detection of the same target, while the TBSU kits measure a single phosphoprotein target and are intended to be combined with a standard AlphaLISA SureFire Ultra kit (ALSU) to assess the second target. The TBSU kits allow for a pick-and-pack combination of any two phosphoprotein targets in the assay lists, providing measurement of two separate targets with ultimate flexibility of selection. The TBSU kits will report the target of interest through the Terbium (Tb) Acceptor beads, while the ALSU kit reports via the Europium (Eu) AlphaLISA Acceptor beads. The Alpha SureFire® Ultra™ Multiplex Phospho + Total assay kits and Phospho + Phospho assay kits (just released) allow the rapid, sensitive, and quantitative detection of phosphoproteins from cells, combined with the measurement of the total amount of the same protein or a second phosphoprotein. This Alpha Multiplex measurement is carried out in the same assay plate well from a single sample of cell lysate, and is achieved by the use of two types of Alpha Acceptor beads that emit at distinct wavelengths (545nm and 615nm). The two distinct Alpha Acceptor beads report their binding to a distinct antigen through their association with specific assay antibodies, as indicated below. The Alpha 615 (Europium) Acceptor bead is directly-conjugated with an antibody to the phosphorylated site on the target protein. The Alpha 545 (Terbium) Acceptor bead is coated with the CaptSure™ agent, which binds the CaptSure tagged anti-total target protein antibody. The Alpha Donor bead binds the biotinylated anti-total target protein antibody. The Alpha 615 (Europium) Acceptor bead in the ALSU kit is conjugated with the CaptSure™ agent antibody to a site on the first target protein. 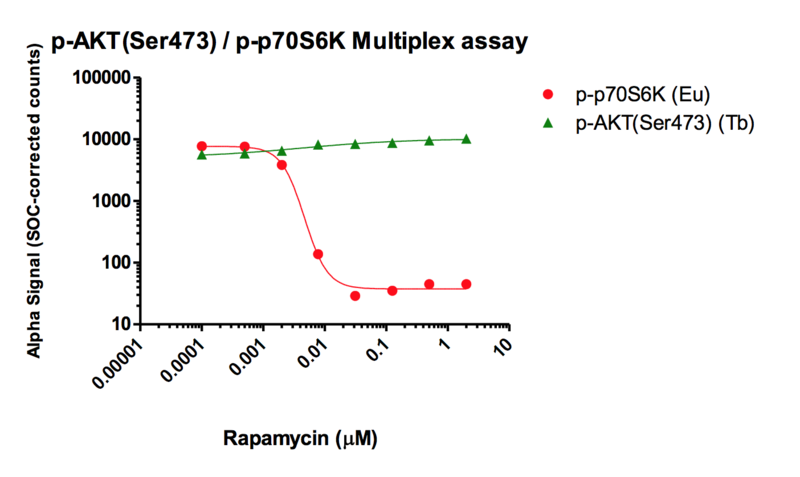 The Alpha 545 (Terbium) Acceptor bead in the TBSU kit is coated with the newly developed CaptSure2 agent antibody, which binds the CaptSure2 tagged anti-target antibody of the second target protein. The Alpha Donor bead binds both of the biotinylated antibodies for both target proteins 1 and 2. In the presence of target protein(s), the antibodies bring the Donor and Acceptor beads in close proximity, enabling the generation of an Alpha signal upon illumination of Donor beads by an Alpha-enabled plate reader. 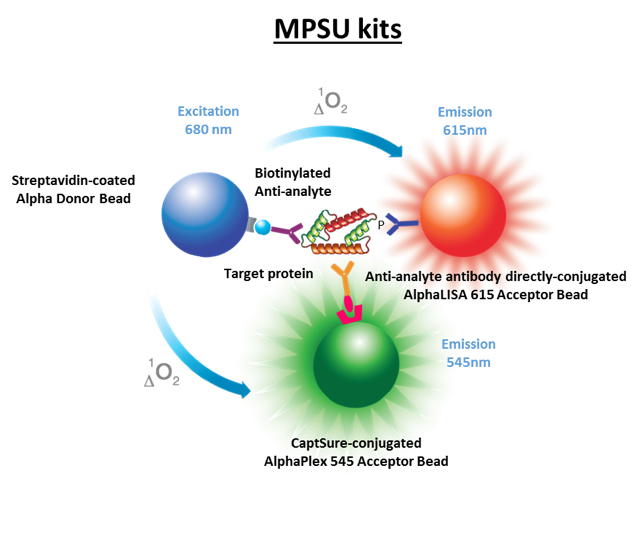 The amount of light emission is directly proportional to the quantity of target protein present in the sample. Alpha technology eliminates the need for laborious techniques, such as Western blotting or conventional ELISA. It is a homogeneous assay with no washing steps and this, combined with the short incubation times and excellent reproducibility (lower CV%) make, it highly amenable to robotic automation. The assay utilizes the bead-based Alpha Technology, and requires an Alpha Technology-compatible plate reader capable of reading dual emission wavelengths. Click here for more information about the AlphaPlex technology and download the “AlphaPlex Quick Start Guide” and the “AlphaPlex Assay Development Guide” to find guidance about filters and mirrors selection, instrument protocol and channels crosstalk correction. MPSU kits for the measurement of phospho + total ERK, and phospho + total AKT are now available. These kits contain all the reagents to carry out the assay. The ALSU kits and the TBSU kits are purchased separately for specific phospho targets, and combined to measure the desired duoplex combination. Protocols for kit combination are provided in the TBSU kit manual. As such, over 900 possible combinations of dual phosphoproteins can be selected for measurement with this flexible system. 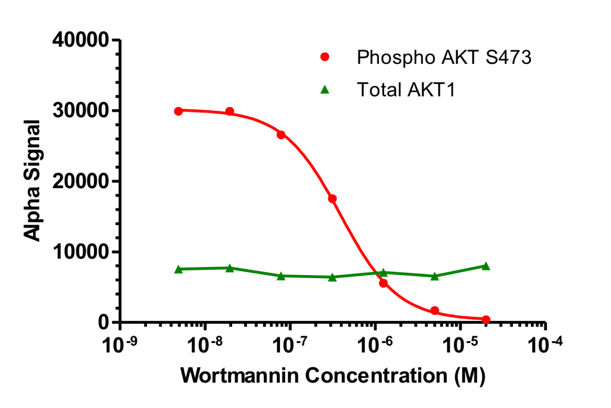 This is shown schematically in the figure below. Contact PerkinElmer for assay kit details, plate reader optimization for AlphaPlex reading, and full details on the current kit portfolio. MCF-7 cells were plated overnight at 200K/mL in 200 mL MEM + 10% FCS. Cells were then treated for 2 hours with varying concentrations of wortmannin in MEM +1% FBS, and then stimulated for 30 min with 2.5mg/mL insulin (n = 3 for each condition). Each well was lysed in 100 mL SureFire Ultra lysis buffer, and 10 µL aliquots of each lysate were assayed simultaneously for p-AKT 1/2/3 (Ser473) and total AKT1 using the Alpha SureFire Ultra Multiplex kit. A431 cells were plated overnight at 200K/mL in 200 mL MEM + 10% FCS. Cells were then serum starved for 2 hours, and then stimulated for 10 min with various concentrations of EGF (n = 3 for each condition). Each well was lysed in 100 mL SureFire Ultra lysis buffer, and 10 µL aliquots of each lysate were assayed simultaneously for p-ERK and total ERK using the Alpha SureFire Ultra Multiplex kit. Multiplex analysis of MEK1 and ERK phosphorylation in A431 cells after treatement with inhibitor. 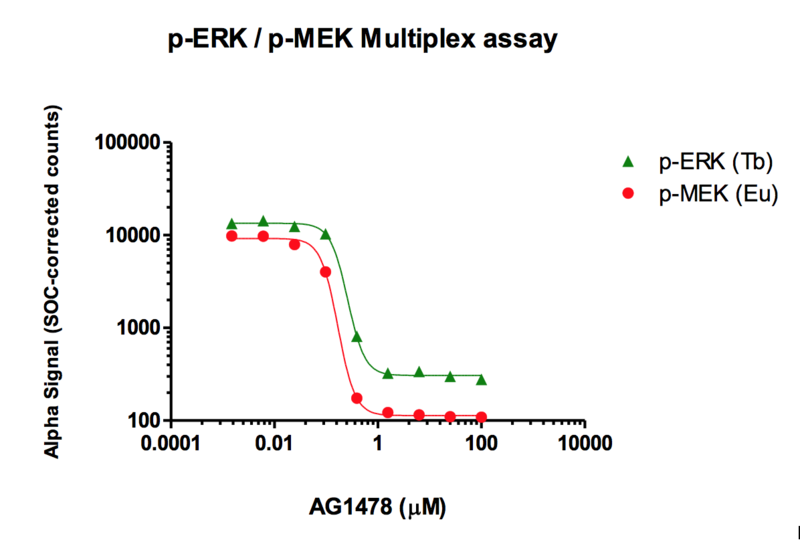 After treatment with inhibutor followed by stimulations, levels of phosphorylated MEK1 were measured using a standard ALSU assay kit while levels phosphorylated ERK were simultaneously measured using the TBSU assay kit. Multiplex analysis of protein phosphorylation in MCF-7 cells. Cells were treated with mTOR inhibitor rapamycin, then stimulated with insulin. 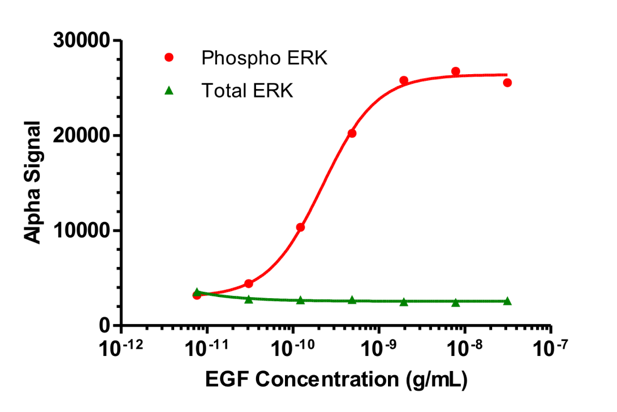 Levels of p-p70S6k (Thr389) were measured by ALSU and p-AKT 1/2/3 (Ser473) levels measured by TBSU. Multiplex analysis of protein phosphorylation in HeLa cells and normalization with Total Cofiin. HeLa cells were treated with either EGF with or without pretreatment with the EGF receptor inhibitor AG1478. Medium was removed and cells were lysed with 1 X SureFire Ultra lysis buffer. A Multiplex Acceptor mix was made by the combination of an AlphaLISA SureFire Ultra (ALSU) assay kit for p-ERK and a Terbium SureFire Ultra (TBSU) assay kit to Total Cofilin. The Total Cofilin TBSU kit has been developed to allow the duoplexed normalization of all phosphoprotein targets analyses measured with the ALSU kit. 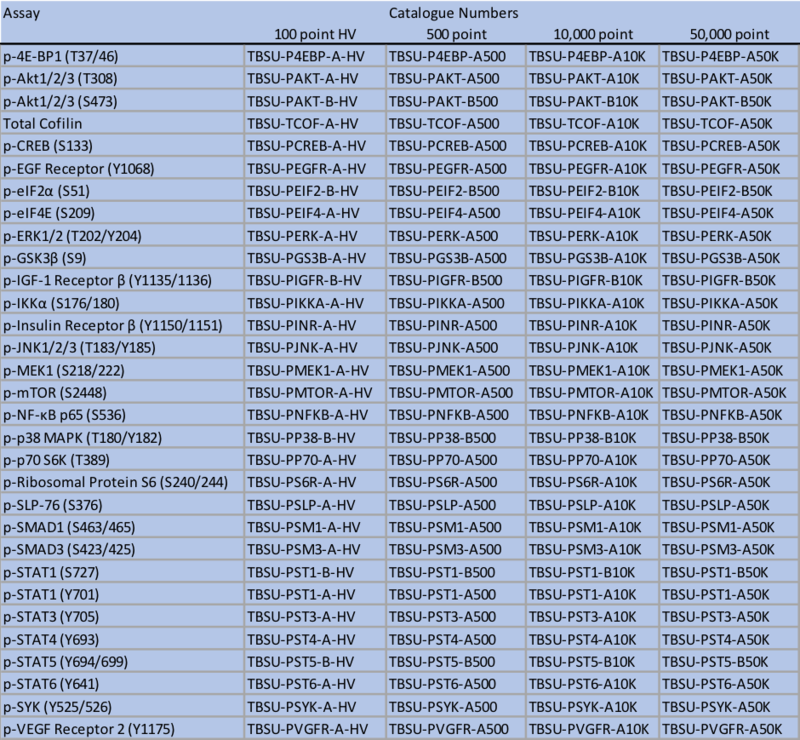 List accurate at 23 February, 2018. Check web site below for updated kit lists.